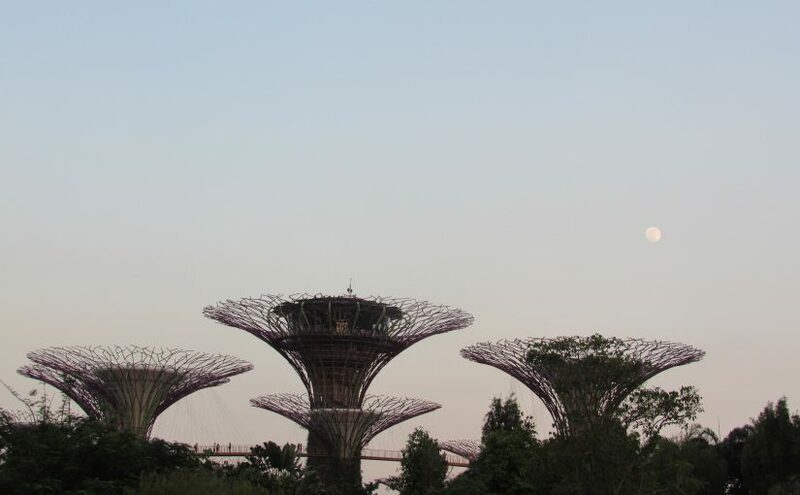 When the sun sets and the moon shines brightest, Singapore streets, shops, and restaurants boast glowing harlequin paper lanterns, a wide assortment of mooncakes and tea, and traditional Chinese crafts and festivities. Every year, Singapore’s Chinese community celebrate the Mid-Autumn Festival, which marks the end of autumn harvest and gives thanks to the gods, especially the Moon Goddess. As the story goes, Chang E, the wife of a ruthless king, drank an elixir of immortality to save her people from him. Chang E ascended to the moon and became the Moon Goddess. My housemates and I decided to check out the Mid-Autumn Festival at Gardens by the Bay. Large, intricate lanterns took the form of flowers, fish, a rooster, a dragon, and moving cranes. They casted soft ambers, reds, and purples against passersby’s faces as they made their way around Supertree Grove. The Grove offered a vast array of stalls showcasing traditional Chinese art, some of my favorites being sugar art, rice writing, and silk painting. Many stalls sold the usual handheld paper lantern lit by candle wax as well as a more modern, battery-powered, plastic lantern. The sky lantern was said to be made originally as a signaling tool during war. As the years went on, the sky lantern took on another meaning: people whispered hopes and wishes before releasing their lantern into the heavens. And oh, food galore. I didn’t know it was possible to love food more than I already do. Adjacent to the lanterns and the Supertree light show, food vendors sat shoulder-to-shoulder on the street market, catering to a salivating throng of customers. Everything was cheap, most items $5 or under. We pooled money into a towering tornado potato stick, dragon breath (a frozen cereal-like snack dipped in liquid nitrogen), scallion pancakes, sotong balls, popping candy, a mystery iced “blue tea” and okonomiyaki topped with dancing bonito flakes. What is a study abroad at Singapore without strolling a food street market with friends? 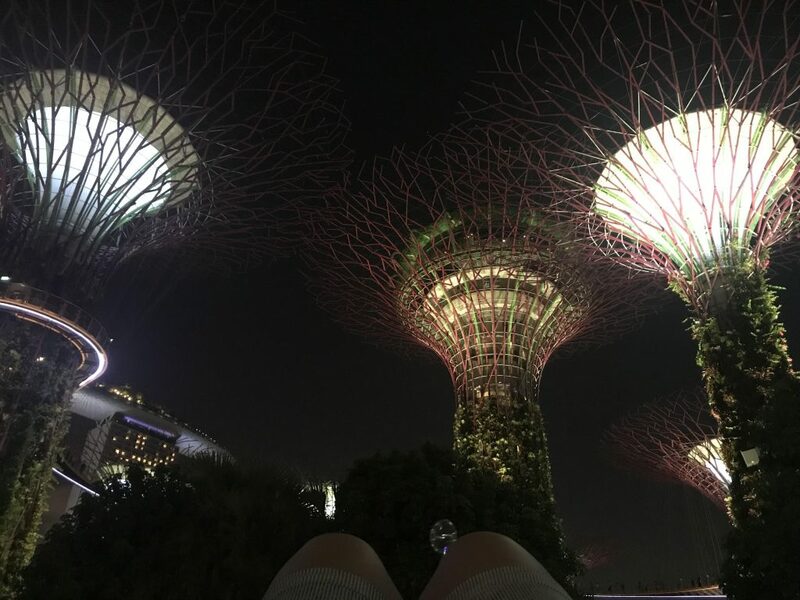 Absorbed by the sights and smells of the food market, we accidentally missed most of the first Supertree light show. On the bright side, we were able to save a spot on the grass and watch a few traditional dances while we waited. This light show actually takes places two times every night, but for the Mid-Autumn Festival, they had changed the list of songs to include soothing Chinese melodies as well as some good oldies like Blue Moon. As the night came to a close, we wandered around the craft stalls, bought some delicious tea, and tried our best to take pictures next to the lanterns (the lighting was not the best; we made do with impromptu lighting with our phone flashlights). On the way back to the MRT, I spotted a few couples and families sprawled on the grass or benches, gazing quietly at the moon and enjoying one another’s company. Check out this video! (It may begin halfway through… Be sure to click on the beginning one it’s started to view the full video!). Whenever someone asks me, “What do you think of Singapore so far?”, I’m never quite sure what to answer. 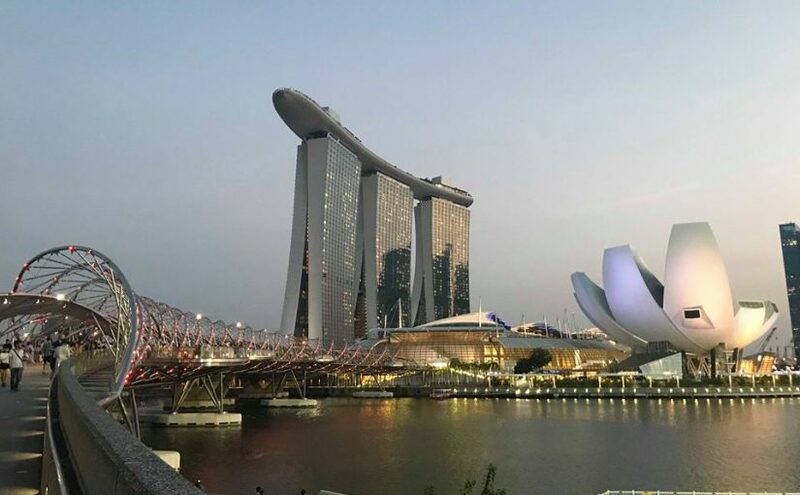 Even though I’ve been here almost a month, the experience so far was basically a surface-level, touristy view of Singapore (hence the Singaporientation blog) and settling into the daily cycle of classes, eating, and studying. Sorry, doesn’t sound so exciting for future study abroad students, right? But after the honeymoon period of studying abroad ends, that crosswalk is no longer a crosswalk in Singapore but a normal crosswalk, not the famous hawker center, but just another place to eat. It’s kind of sad, but after this liminal period, I do feel like I’ve moved onto a new stage: reality. Many people have this idea that reality is dull, but to be fair, reality is as interesting as it gets. Met up with my Resident Director, Andrea, and one of the other visiting students, and took a taxi to my new apartment, Sunshine Plaza. Familiarization Tour – Andrea showed us the surrounding area, places where we could grab some quick food, some general stores, and the MRT. Took the MRT to Clarke Quay – The train stretches across almost all of the city and goes several stories down; it took us seven escalators to get to the blue line. At Clarke Quay – Treated out to McGettigans for fish n’ chips by RD (thank you :D). Time to chill at the apartment – We activated our SIM cards, discussed tomorrow’s schedule, and got to know one another. The rest of the time was spent unpacking. Woke up at 6 a.m. and couldn’t go back to sleep so I watched some Youtube videos. The night before I was sneezing like crazy because we haven’t figured out how to control the room’s AC yet. Needless to say, I was tired. We had the morning to ourselves, so I called with my parents. It was about 10 a.m. in SG but 10 p.m. in CA. Breakfast (toast spread with a Singaporean coconut jam called Nonya Kaya and cereal). Enter Andrea who brought us to Suntec City Mall. In-door Hawker Center (tried chicken rice for the first time and iced calamansi tea). Giant Mall (I appreciate how literal some of the names are. For instance, we saw a bag of chips that was called “Bag of Chips”). Narrow walkways, street art, charming mom n pop shops selling a wide array of textiles and food. Andrea dropped us off at SMU to get our Student Pass slips. Self-tour around SMU (one of us had some trouble with the ID picture, so we missed the free official campus tour). Because we haven’t gotten our student cards yet, we had to get into buildings using our passports. Even then, most buildings said no, so we were only able to get into the library. At one of the vending machines, we tried a can of grass jelly which two of us hadn’t tried yet. 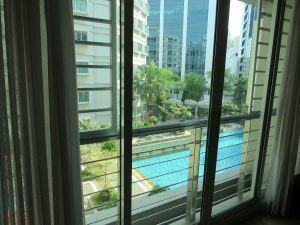 Hung out at the apartment and got to know one another some more before heading back to Suntec City Mall (with much confusion and discussion, we finally figured out the MRT system). Bought some avocados, an extension cord, bread, onions, and a rice cooker. Fountain of Wealth – I followed the instructions, except for the most important one: Make a wish. Woops. Showed a friend from Hope who was visiting for a few days around the school and the apartment (s/o to my roomie, Yeji). Met up with the other three at the SMU Admin building for SMU Orientation. After signing in, we got goodie bags filled with SMU swag and were served delicious Singaporean food including laksa, a spicy noodle soup. We had to sit on the floor because of the lack of tables, but as a result we were able to meet a few kind Canadian transfer students. Ice breakers (What’s an orientation without ice breakers?). Introduction to the different student organizations, tips on how to get around SMU and what to do when traveling abroad. Naptime (I’m an introvert, I needed to recover). Meeting with Yeji and her family at Makansutra Gluttons by the Bay: chili crab, carrot cake (it’s not actually made of carrot or cake; it tastes more like pork belly), cereal prawn, and iced barley. Orientation presentation by Andrea: Cultural lessons. Don’t clean up after yourself when eating out, because the workers will see it as rude. Leave your leftovers neatly on the tray and let the workers do their thing. For some elder Chinese vendors, use both hands to give and accept money. The same thing goes when handing out/receiving business cards. Trip to the Botanical Gardens. Lunch at the Bee’s Knees at the heart of the Gardens. Trails through the Learning Forest. Saw some wild chickens and monitor lizards. Suntec Mall again (I know, we go a lot). Riverboat tour at Clarke Quay. Back on boardwalk for dinner at Ras, a stellar Indian restaurant: paneer, chicken tikka, daal mahkni, rice and naan, and iced tea. Music and chill at home. This place is gorgeous!!! I love the Botanical Gardens. We found a wild chicken stuck in a tree. I hope it found its way down. Meomi Cat Cafe on Haji Lane. They take stray cats from the streets and those who are fit for cafe life spend time around doting visitors. Quick stop by Suntec Mall. Satay by the Bay: Prawn, pork, beef, fish, and a lot of different meats with a peanut dip. Marina Bay Sands Observation deck. Andrea treated us to Din Tai Fung: Xialongbao (Chinese steamed buns) and other side dishes. Meomi Cat Cafe except the cats didn’t want to be petted, only fed treats. Suntec Mall with roommate, ate at McDonald’s and had a Durian McFlurry and a breakfast curry burger, shopping at H&M and Cotton On. A short stop by SMU Vivace, the university’s student organizations fair. Chilling out at the house, bonding with housemates. Got Dominos delivered to the apartment and watched The Italian Job with an HDMI cable. They had the Big Mac but why would I pick that when I could get the curry burger? SMU Vivace is a student activities fair where students perform on stage and pull Bambi-eyed freshmen to their booths. Many of my fellow international students were forced to find affordable hostels in sketchy parts of Chinatown. Meanwhile the TEAN program ensured its programees a three-bed, three-bath in the illustrious multi-purpose complex that is Sunshine Plaza. The moment I entered the room, I knew I had scored the jackpot. My three other housemates and I were situated on the seventh floor with a patio window facing a large wave pool, complete with a waterfall design and a jacuzzi (although it didn’t actually heat up; it just made bubbles). All utilities, electricity, water, and AC, were paid for by TEAN – we only had to concern ourselves if the AC usage went over budget. Otherwise, we also had our own washer and dryer. The living area was sort of separated into three spaces: a desk area near the door, the dining table, and the area with a TV, two modern-style couches and a coffee table. Considering the beautiful view, which effectively opened up the room, I’m not one to complain about the not-so-spacious living arrangement. Besides, it was the perfect amount of space for four residents. When they told us not to overpack, I should’ve listened. TEAN uses this apartment for every group of visiting students so either past students or our beloved RD have left kitchen appliances like a toaster, a coffee maker, and a water kettle as well as bowls, plates, utensils, knives, pots and pans, measuring cups, a water filter pitcher, a dish rack, and whatever else a kitchen could have. We later went out and bought a rice cooker to add to the growing generosity of kitchenware. There were already two cartons of milk in the fridge and some snacks including laksa-flavored ramen, green tea Kit Kats, and Oreo straws in the cupboards and on top of the microwave. Out in the living area, a closet was filled with other miscellaneous items like an ironing board, an iron, a vacuum cleaner, another lamp, and even spare cabinets (although some were broken). A desk against the wall at the entrance also had spare notebooks, adaptors, pencils, pens, paper clips, and so on. Our rooms were also decorated and maxed out with supplies. On our beds, they had lain out a body towel, a face towel, more Singaporean snacks and treats, hand wipes and tissues, and a welcome note from the RD and RD’s Assistant. In our wardrobes, they gave us each our own clothing hampers and hangers as well as extra pillow covers. In our bathrooms and underneath the sinks, we were given cleaning supplies, sponges, and soap, and we have both a tub and a shower area. Just had a nice hot tub session, and I can say it does wonders for neck pain. In addition to the supplies, appliances and fully furnished rooms, TEAN also invested in some minimal interior design; fake plants, paintings, fancy lamps, and even an Asian conical hat decorated the walls and tabletops. 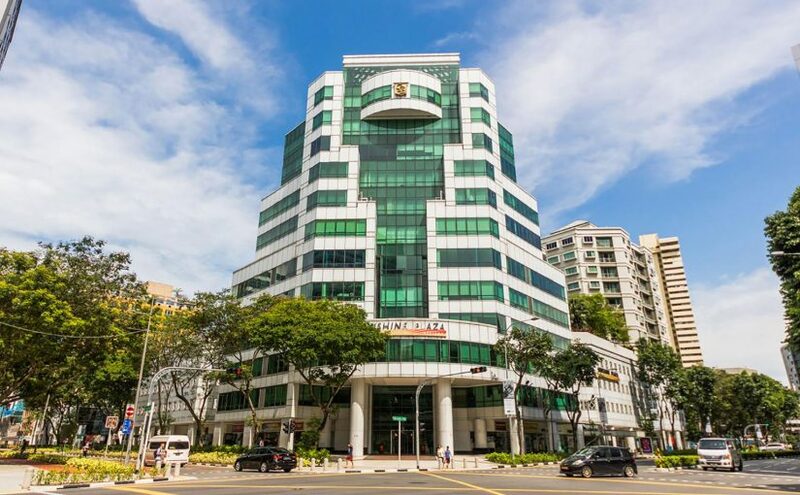 The building itself, as I said before, is multipurpose, which means while it is an apartment, it also has office space, and at the ground floor, Sunshine Plaza boasts its own mall. If you walk around the block, you’ll find restaurants and general stores in close proximity. It’s also about a two- to three-minute walk to the blue line, which goes almost everywhere, and the yellow line, which will take you to some tourist destinations but more importantly Suntec Mall where you’ll buy groceries and school supplies, visit the post office, and attend to other daily needs. From Sunshine Plaza to SMU, it’s about a five- to ten-minute walk depending on which building you’re heading to and how long you have to wait at each crosswalk. Now these are the good aspects about the apartment, which I believe greatly outweigh the negatives, but I feel like the negatives should be made known for future students’ benefit. I share a room with a wonderful roommate, but I did come second and got second pick when it came to beds and wardrobes. One bed is slightly raised and has a backboard and some cabinet space attached to the side. The bed I ended up with, on the other hand, was more like a glorified cot. I could feel and sometimes even see the coils and springs. A few days into my first week, I had to borrow a mattress pad from one of the other rooms due to the morning back and neck pains (hence the hot tub sessions). Moreover, don’t bring or buy a lot of clothes. 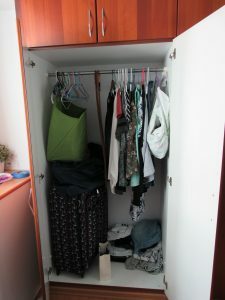 We do have wardrobes, but while one of the wardrobes does have a little bit of storage space, the other only has hanger space (guess which one I ended up with). I had to fashion my own storage space using plastic bags and a hanger. The rooms are pretty small, so they recommend bringing only one luggage bag. As for the other two rooms, one room is possibly larger than the master bedroom that I was in, while the other is more akin to a closet with two beds jammed inside. Harry Potter wouldn’t envy it. In other words, first come, first serve. We do get the option to switch rooms halfway through the semester, but that’s up to the residents. The kitchen area and the bathrooms open up to Singapore, so we always have to close the doors to these areas in fear of wasting precious AC. This isn’t so bad, but it’s staying in these places for a long time that will leave you panting and sweating, especially when the steam from cooking or showering adds to the hot, humid air. There’s limited kitchen cupboard and refrigerator/freezer space (don’t buy too many groceries) and not a lot of counter space for cutting vegetables or other cooking needs. The washer and dryer, which are adjacent to the kitchen, are also tiny. They can only wash about a half-week’s worth at a time and both squeal like tortured squirrels if you try shoving in more than they can handle. And while the open window to the pool area is nice, you might accidentally make eye contact with a neighbor from across the way who also happens to have a patio facing the pool. In fact, you might make eye contact with several neighbors… The first few days are uncomfortable and awkward but you get used to it the more you live there because the residents mostly mind their business and don’t care if you’re watching National Treasure at twilight hours. With exception to the few nuisances, the first few weeks living in Sunshine Plaza has been something of a resort vacation. I only remembered I was studying abroad, and not just abroad, when the first week of classes hit. Twenty hours. That’s fourteen hours from San Francisco to Taipei, about an hour at the terminal, then another five till Singapore. If you’re like me and haven’t ever flown for this long, then twenty hours seems impossible. I’ve been flying back and forth from California to Michigan and can’t even stomach four-hour flights. This is also the first time I flew out of the States alone. For some reason, I decided my first transcontinental flight was going to be to the other side of the world. So you could imagine my mental state when I hugged my parents goodbye and made my way through the security checkpoint. Everything went smoothly, at first. Like always, found a seat with a charger at my gate, filled my water bottle, went to the restroom, and so forth. The line slowly inched forwarded as my fellow fliers boarded the plane. My seatmates were two middle-aged, kind gentlemen. I settled in. The plane seat cushion was pushing my head forward. I tried my best to scoot to the side so that my head rested next to the window, but now my neck was tilted at an awkward angle. The characters on my phone screen yelled at each other and ran away from an explosion. I rubbed at my neck. The man beside me snored and tilted precariously closer. I shifted in my seat again. He swayed and landed on the other passenger who snorted in his sleep. The flight attendants carried in plates of food. I picked the braised chicken and potato, which was delicious, and stored the fruit and dessert under my chair for later. A few minutes after I had finished, the yellow seatbelt sign flashed and ticked above us as the plane trembled against the wind. My stomach turned. I sat straighter, looked up, and prayed that I wouldn’t be that one passenger who had to use the small paper bag. Once the nausea subsided, I popped some pills for motion sickness. I woke up and checked my phone. Perhaps we were close to Taiwan by now? Two hours! I had only slept for two hours; there were still eight to go. I turned on my phone and pressed play. On cue, the characters jumped and punched and dodged. After a while, the image blurred so I put my phone down. At least I wasn’t getting motion sick anymore, but I was getting bored and needed to go use the restroom. To my right, both men were still asleep but I decided to bother them later when they were awake. I wondered how they could sleep so comfortably for so long. I reached down for my bag to pull out a pad of paper to draw or write on – and nope, my stomach churned angrily. Okay, so I wasn’t feeling up to par yet. Maybe I should wait it out. I pressed play on the phone and let my eyes glaze over. Somehow I managed to sleep again, which was a blessing. Another three hours shaved off and now I was more than halfway there. Somewhere along the way, I had lost the tiny pillow they had given us. I checked under my seat and noticed the food that I had stored for later was also missing. Great. I tested reaching for my bag and my stomach stayed silent. I had some vitamin gummies and checked the time again. It was an automatic motion. Every few minutes I would take a peek at the screen and slowly the dread in me was building. What was I going to do for five more hours? I didn’t need to go to the restroom anymore, almost like my body was slowly realizing its reality and started adapting. Rummaging around my bag, I pulled out my pad of paper and sketched my seatmate, who was of course still sleeping. I wondered if he ever woke up this whole flight. They brought out the food again: an omelette with sausage and broccoli and raisin bread, yogurt, and fruits for side dishes. I wasn’t aware of how hungry I was until I peeled off the foil and the smell of fried egg hit my face. I scarfed it all down and, as scheduled, the plane shook from turbulence and the nausea set in. I popped some more pills and checked the time. Two hours is manageable. For the first time on the flight, I cracked the window open and looked out. It never got old. The vast expanse of ocean that met the sky, spotted with white rippled reflections from the sun and dark shadows from the clouds floating beneath us. In the distance, a silhouetted stretch of land. At last, I had made it on the other side of the world. My first order of business? Restroom. After I relieved myself of fourteen-hours’ worth, I joined the line at the security checkpoint and entered the terminal. The Taipei Airport was amazing. There were tiny museums and displays, a flower garden, themed gates, and even a tea ceremony area. I pulled out my camera to take it all in. The plane was the famous Hello Kitty plane. Everything from the screen animations to the pillows to even the puke bag was Hello Kitty-themed. Needless to say, I was impressed and dying from the cuteness of it all. Compared to the fourteen-hour flight, this five-hour was nothing. I had my nap. Ate just enough. When the plane trembled, I took my pills. I also played around with the screen in front of me. Tetris, bowling, chess. I settled on Monsters University, which I had seen before, but nothing beats a classic. At last the plane swooped onto the track and slowed to a stop. I looked out the window and met Singapore face-to-face.